On Wednesday, June 29th, we welcomed back Dave Olson, Community Wrangler at Hootsuite, for Social Marketing Kung Fu session number four at Bootup HQ, entitled Building a Posse. Dave talked about three different types of people that want to be a part of your posse: rockstars, gardeners, and interns. They all have different motivations for being a part of your community, and have different talents to offer you, thus, they should be rewarded accordingly. You must provide them with some restraints, though, so that no one is speaking on behalf of your brand but you. Rockstars are the ones who are concerned with their personal brand, and what they get out of their relationship with you. A great example of a rockstar is a high profile blogger. If they help promote your product online, they are going to want to be rewarded publicly online, so Dave’s suggestion is to thank them on the blog with trackback links, pictures (flickr), twitter mentions, etc. Plus, everyone loves some good swag every now and again. Gardeners are the power users of your product that do things for you because they are fans, and they care about the product. This might be a developer who discreetly tips you off about a bug or glitch in your system, or a keener who makes a video tutorial on a product you just launched. Dave’s tip for rewarding these types of people is obviously a huge personal THANK YOU, and a mail delivered package of company swag, to make them feel like the special person that they are. Interns are exactly what you think they are. Recently graduated from university, looking for a career, and wanting to be a part of an awesome company. Dave’s advice on interns (and he’s an expert, he’s had about 20 at Hootsuite, and calls himself the “intern whisperer”) is to NOT treat them like interns. First of all, give them a title that means something, not just “intern.” Don’t make them go get your coffee. There are always going to be mundane tasks in every job, but give them inspiring tasks to feel like they are doing a real job. In the process, you will find out what they excel at. They are going to be an extension of your company, and they’re going to be talking about your company. Hootsuite uses twitter lists to monitor these different types of people and their conversations. Using just search terms and hashtags gets too messy and too complicated. One thing Dave told us, is that when he finds someone who has said something interesting about Hootsuite on twitter, he will go to their profile and find out: who they are (even check their LinkedIn profile), where they’re from, what do they tweet about, and who are they having conversations with. He then jumps into their conversation to “lob the tennis ball,” and then waits for them to hit it back. A new initiative Hootsuite is working on is organizing Hootups (like a tweetup, but for Hootsuite users), and they have encouraged people to start organizing their own Hootups. If you organize an event, and send an e-mail to Hootsuite telling them about it, they’ll send you some hootkits (swag) to give away as door prizes. Obviously these people are going to be posting pictures, tweeting and blogging about the event, so it’s a wicked way to get people talking about your product. Another thing Dave pointed out is that it doesn’t require a lot of money to be an influential brand. 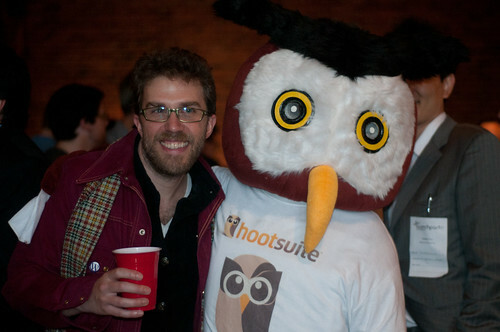 Hootsuite was named one of the top 5 influential companies at SXSW in 2011, and the biggest expense for the conference was for handing out free beer koozies. They didn’t do any major stunts like sponsor parties and give away free booze, but they DID pay someone to wear the Owly mascot suit every day during the conference. See, marketing can be cheap! What makes people want to feel a part of your community? Find out and amplify their story. Inspiration is the key to motivation. Amplify your success to make more! Please share any ideas you have or takeaways we may have missed in the comments below. Our notes from the last couple of talks can be found here and here, and Dave posts all of his notes on Tumblr for those that have missed the previous talks.